I decided to pack away the Voila S553 doll house this weekend. 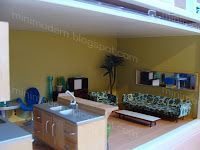 If you've seen the previous post then you already know that I'm tinkering with the Lundby Stockholm 2005 dollhouse in its place. It's interesting to be working in a different scale--1:18. I've promised myself that I won't buy anything new for it, but we all know that's a lie! First, I'll see how many different rooms I can come up with using the stock that I have. I had to dig out some old school stuff to get to the Lundby furniture and lo and behold, don't you know I came across some Ikea PS Eskistuna stools that I completely forgot about. Weird. I have nowhere to put them so they got shoved back into storage where they will eventually "surprise" me again in another year or so. You know, I actually was thinking about trying to put some 1:12 pieces in there. I'll give it a shot over the next couple of days and post pics. And, yes, ha ha, the Bombay and child is just my poor attempt at humor. I'm curious to see how you're going to cram 5 kids into the one bedroom! 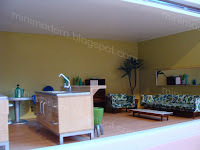 Where did you get the cabinet, sofa and chairs from? I got it from ebay. It is from an old 1:18 Pacifico set made in Japan. The sofa and chair is wonderful. 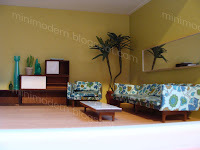 I have just seen it on http://amysminiaturesandsmalls.blogspot.com/2010/02/sofa-chair.html and one of the comments mentioned your set too. It looks great.